Here is the handwheel installed to replace the handle what a difference in the operation much smoother and convenient . Here is my new vise design addition that I made the sprockets for in this post . 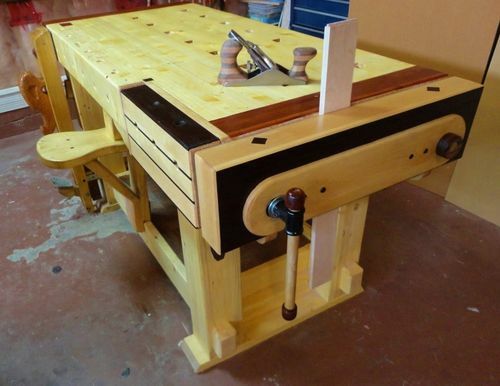 This is the original bench and vise configuration which had a single screw end vise and you can look at the video using the attached link . This vise uses the cog belt and plywood sprocket that I made and two ACME thread rods . 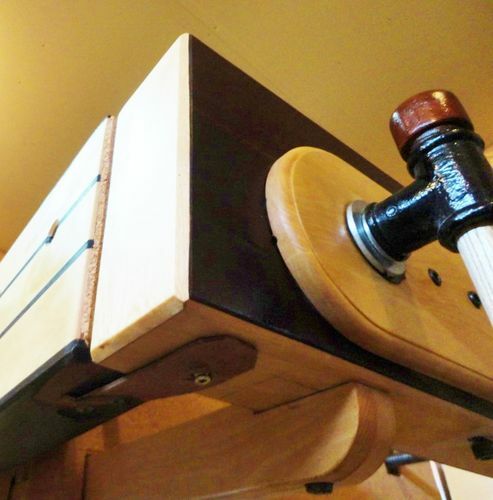 I can also use the tail vise to clamp along the front apron using the dog holes at the front of the chop and apron and the Kiefer vise V3 is still in the same spot and so far has been my every day vise but like any vise it has limitations and brought about this new concept . 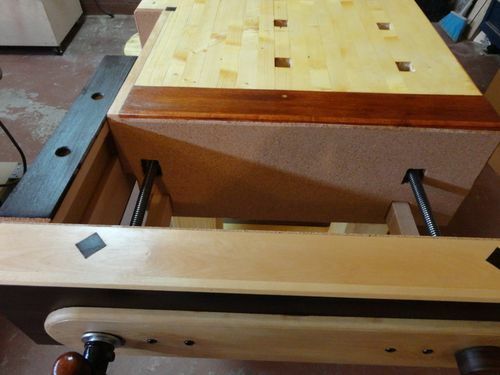 By making this configuration I have the benefit of being able to use this setup in just about any clamping arrangement that I require using only two screws . Now that this is all done I have to arrange a new dog hole pattern using round holes . 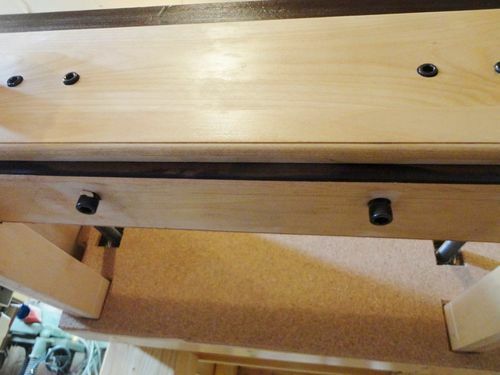 This project is all made from material that I had on hand and the only items that I purchased for this are the threaded rods and nuts and some washers and bearings for a total cost of about $50.00. Even the handle and fitting are from my old end vise and the cork for the chops where a gift from a friend and BTW holds very well . Any question that arise are welcome . very cool end vice. I like the double sprocket set-up. 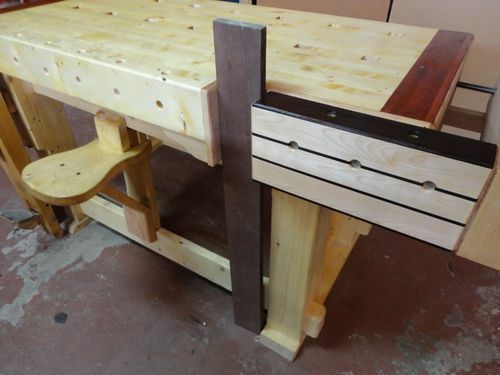 Your bench and vise arrangement sets the standard by which all others will be judged…..nice !! I not only envy your vise but having space to use it. You have built so much functionality into it and it is beautiful as well. Amazing kiefer! I have been saving all of the used timing belts I replace at work because of you. Great creative thinking Klaus. You should be getting a subsidy from whoever makes those timing belts. You have created a whole new market for them. Super design and workmanship. Congrats. 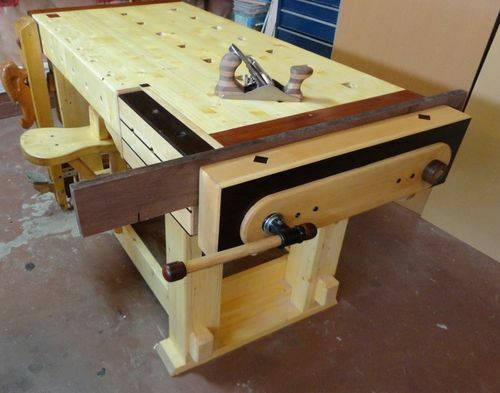 Another amazing creation Klaus, and quite useful to boot…...great work. Awesome and entirely too nice…! I’m thinking as I go down the comments. Yep, Yep, Yep! Got to Greg’s comment and I was thinking as I looked at your pictures. “It’s too beautiful to lay a tool on!” Can’t wait to see the video as I’m a subscriber. Oh yeah, Kiefer you were due for another spectacular project. The video was too long so I will try to edit it and upload to you tube again ,be patient .